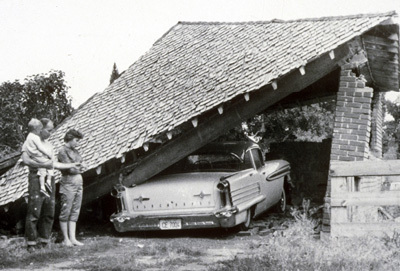 The large opening of a garage door and the weight of a second-story room built over the garage can result in the walls being too weak to withstand earthquake shaking. When the narrow sections of the wall on each side of the opening are not reinforced or braced, the weakness is worse. 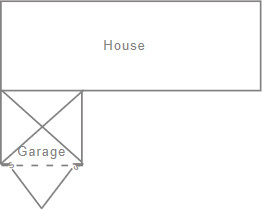 Is the house shaped like Figure 31? If this is the case, are there braces or plywood panels around the garage door opening? If there are no braces or plywood panels, strengthening may be needed. Home configuration where there is no in-line wall. Additional bracing may be appropriate in this situation. Consult a licensed architect or engineer to determine the strengthening required! 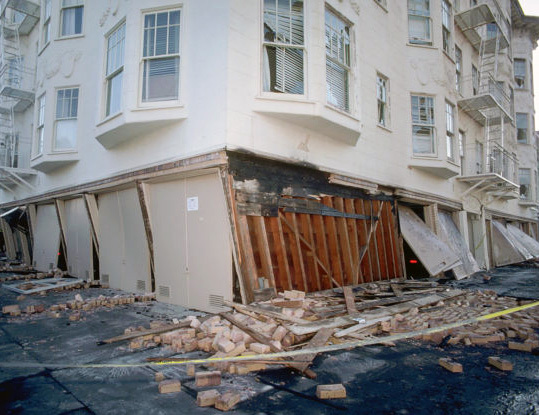 Remember – Many homes with this weakness have been severely damaged in past earthquakes. If your house has a room over the garage, the garage walls may not be strong enough to hold up during an earthquake unless they are braced with plywood panels and steel straps. Consult a licensed architect or engineer to design plywood paneling or a steel frame around the door opening (See Figure 32). Obtain a permit from your local Building Department.